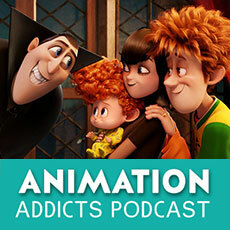 The Rotoscopers get together for episode 105 of the Animation Addicts Podcast, where they review Sony’s 2015 animated film Hotel Transylvania 2. General Info and the review embargo. ANIMATION: Even MORE cartoony than the last film! Are we watching Looney Toons? Thoughts on technology prevalence in films. The Plot and the Ending. Did they work? Listener Twitter and Facebook questions. How long do you wait to see a movie when it comes to theaters? Don’t forget to use the hashtags #AnimAddicts and #AnimAddicts105 when talking about this episode on Twitter!